Cynopsis Digital Model D Awards: Innovators. Inspirers. Creators of all kinds. We celebrate those in online video content and advertising who are at the forefront of this new industry, elevating it with their state-of-the-art contributions to branded content, technology, ad campaigns, and original content. Save the date – Friday, November 14th at the Grand Hyatt in New York City. *Best New Web Series: This award honors new scripted or unscripted original series exclusively produced for the web and created within the past year. Branded Integration in a Web Series: This award honors an innovative branded integration in a web series; recognizing a product placement that is not obtrusive, but is inserted seamlessly into the narrative and effectively drives brand lift. Branded Integration in a Web Video: This award honors an innovative branded integration in a web video or clip; recognizing a product placement that is not obtrusive, but is inserted seamlessly into the narrative and effectively drives brand lift. Branded Web Series: It’s not just about spots and sponsorships, brands can be content creators too. This award honors the brand, agency, and/or producer/studio behind a branded series made exclusively for the web. Branded Web Video: It’s not just about spots and sponsorships, brands can be content creators too. This award honors the brand, agency, and/or producer/studio behind a branded clip or web video made exclusively for the web. Connected TV Platform: This award honors the best platform/device for streaming web content to smart or connected TVs. It will include content availability and discovery, user interface, and other innovative or unique features. Daily Series: A daily program (live or not live, short-form or long-form) produced exclusively for the web. *Digital Consumer Brand: The consumer-facing brand that best demonstrates excellence in video creative, execution and success across platforms and consumer touch-points. Digital Studio/Production Company: This award honors the studio or production company that is not only producing compelling, original content for digital platforms, but is demonstrating creative ways to distribute and monetize their libraries across platforms and markets. Digital Television Group: This award honors the digital division/group of a broadcast or cable network that’s at the forefront of the digital revolution. Awards those not only developing innovative ways for their consumers to access video content, but engaging viewers on multiple devices, via social media, unique digital campaigns, etc. Digital Video Ad Platform: The top video ad management and measurement platform that not only offers advertisers the ability to reach and engage with consumers across platforms and devices, but serves as a can’t-miss thought-leader within the evolving digital advertising ecosystem. Digital Video Technology Platform: The top video technology and publishing platform, as determined by tools and features it offers to publishers and media companies that want to deliver video content to consumers across screens and platforms. Live Show – Solo Event: A live, singular event streamed via the web. Categories include music/concert, sports, political coverage, special events, among others. *Most Fan Engaged Channel: This award honors a channel (on YouTube or MCN) that reels in the most fan engagement, or the ability for a producer to evoke a significant reaction from its audience. Engagement factors in views, subscribers, comments and social media factors involving “likes,” “retweets,” “favorites” and more. Please submit nominations that include data for these measurements listed. *Over-the-top (OTT) Content Service: Recognizing the app/service with a proven ability to delivery of video, audio and other media content over the web without a multiple system operator being involved in the control or distribution of the content. Social TV Service: Recognizing the app/service with a proven ability to engage users with TV programming by providing them with an innovative second screen and social TV experience. TV Everywhere App: Recognizing excellent video quality, user interface, and content availability, as well as other innovative features within an app that lets users watch live and/or on-demand TV programming whenever, wherever. Use of Companion Video for TV Show: Who says TV has to stay on TV? This award honors the video, webisode or series developed to extend the program or storyline of an existing TV Show to increase viewer interest and engagement. Web Series: Scripted original series produced exclusively for the web (programs that were repackaged and transitioned from the web to TV are also applicable). *Web Video: Scripted original video, short or clip produced exclusively for the web (programs that were repackaged and transitioned from the web to TV are also applicable). YouTube Multichannel Network: This award honors the top YouTube programmer that owns and operates multiple channels on the video site. Video Discovery Service: With the incredible and growing amount of video content available online, it can be overwhelming for users to navigate and find stuff that they want to watch. This award honors the video discovery service/app that filters and curates video content (both online video and TV programming available via web services) for users based on past viewing history, interests, and what their friends and social media followers have liked, among other things. YouTube Original Channel: This award honors the top YouTube channel within the video site’s ongoing original programming initiative. Multiplatform Marketing Campaign: Broadcast TV: This award recognizes excellence in the creative and strategy behind a marketing campaign that utilizes multiple platforms, screens (traditional, digital, out-of-home), and tactics to promote a broadcast series. Multiplatform Marketing Campaign: Cable TV: This award recognizes excellence in the creative and strategy behind a marketing campaign that utilizes multiple platforms, screens (traditional, digital, out-of-home), and tactics to promote a cable series. Multiplatform Marketing Campaign: Web Series: This award recognizes excellence in the creative and strategy behind a marketing campaign that utilizes multiple platforms, screens (traditional, digital, out-of-home), and tactics to promote a web series. Social Media Campaign For Broadcast TV: This award honors the agency and/or network that demonstrates most innovative use of social media networks and services to promote viewership as well as viewer engagement with a broadcast TV series. Social Media Campaign For Cable TV:This award honors the agency and/or network that demonstrates most innovative use of social media networks and services to promote viewership as well as viewer engagement with a cable TV series. Social Media Campaign For Web Series:This award honors the agency and/or digital network that demonstrates most innovative use of social media networks and services to promote viewership as well as viewer engagement with a web series. *Best Actor in a Web Series: This award honors an actor in scripted or unscripted series produced for the web, or an actor that transitioned from a web series repackaged into a TV series. *Best Actress in a Web Series: This award honors an actress in scripted or unscripted series produced for the web, or an actress that transitioned from a web series repackaged into a TV series. *Best Celebrity Integration in a Web Series or Channel: This award honors the best integration of a celebrity cameo or celebrity playing a scripted character in a web series or channel. The celebrity could have appeared once or multiple times within the programming. *Best Female Character in a Web Series: This award honors a favorite female character written for a scripted web series, or in a series that was repackaged from web to TV. A character must be a prominent figure within the series, or appear at the least in a single season. *Best Host in a Web Series or Channel: This award honors the top host of a web series on a multi-channel network or YouTube channel. *Best Male Character in a Web Series: This award honors a favorite male character written for a scripted web series, or in a series that was repackaged from web to TV. A character must be a prominent figure within the series, or appear at the least in a single season. *Teams of the Year: recognizing outstanding collaboration internally and among clients and agencies, the judges will choose the teams whose results in the past year are only second to their outstanding work culture. *These categories are new to the 2014 Cynopsis Model D Awards! 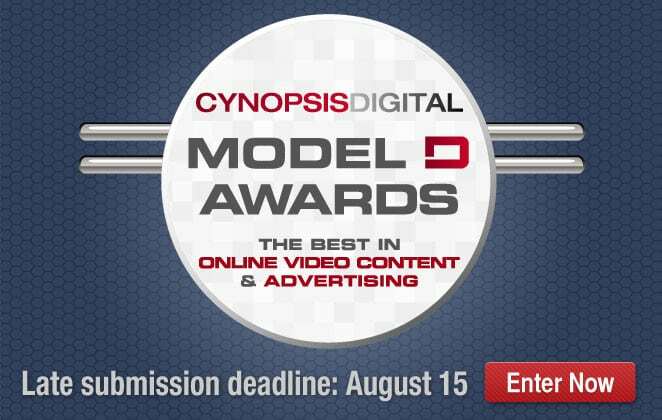 The Cynopsis Digital Model D Awards are open to all individuals and teams worldwide including: production companies/studios, producers, networks, composers, lyricists, animators, video game developers/producers, website developers, mobile & app developers/producers, e-book creator/producers, licensing companies, marketing companies, pr firms, ad agencies, creative services teams, developers, interactive advertising/media, online film/video, and social content. Vendors are also eligible to compete on behalf of a client. The program is open to national and international entrants. Multiple entries are accepted, and a single entry can be entered into more than one category. Please follow the “How to Enter” instructions below for each additional category you will be entering. To be eligible, the entry/campaign initiative must have taken place (either in part or in full) between May 2013 and May 30, 2014. The sports program or initiative must have taken place during this time, but it’s not necessary for it to be completed during the eligibility period. Note: although we welcome international entries/campaigns, they must have been at least partly accessible in the North American market. All entries are held in strict confidence and we will not share information unless we receive permission from the entrant. Enter online here. First, you will be stepped through the registration process, and then the nomination (synopsis + supporting materials) and payment process. Start here. While these headings are not mandatory, we do recommend using as many as you can as it relates to your entry. The more information provided, the better! All entries must be submitted online by August 8, 2014 at 11:59pm EST. Entries submitted between August 8 and August 15, 2014, will automatically incur a $175 late fee, per entry. Finalists will be notified in late-September and honored on November 13, 2014 in New York City. Entry Fees: The price of each primary entry is $350. If you submit the same entry into multiple categories, the additional fee is $175 per category. There is a late entry surcharge of $175 per entry (after 8/8). Payment in full must accompany the entry and fees are non-refundable. Receipts: Once your entry is submitted and paid, you will be emailed a receipt confirming the payment. The receipt includes payment date, amount and card number. You can also download a full Invoice that has all the entries paid for listed on it. To sponsor the awards event, purchase a program ad or advertise in the Special eReport, please contact VP of Sales & Marketing, Mike Farina at 203.218.6480. Please contact Awards Coordinator, Pete Romas at 203.899.8483.